Bonnie Schertz, Mizocz Women, Poland, 1942: a collaboration, 2018. Silkscreened photograph on cotton, muslin backing, unspun wool, metallic and novelty threads, floss, eyelets, wire and beads using surface embroidery, beading, stump work techniques. The accompanying copper pipe piece: Bonnie Schertz and John Giraldi, This is What Remains, copper plumbing wire, 2018. Photo: John Giraldi. Devon Spier is a writer and rabbinical student at the Academy for Jewish Religion in New York. Bonnie Schertz is an artist and lawyer living in New York City. 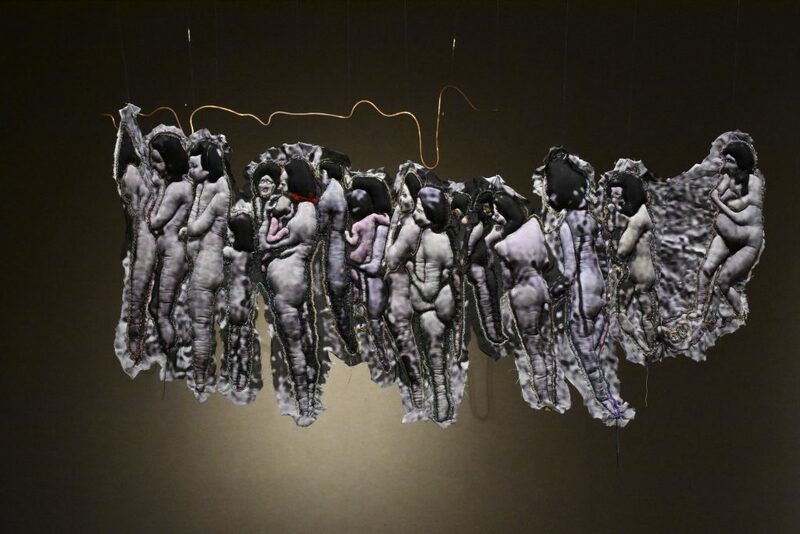 She uses embroidery, knitting, crochet and paint with various media to explore and express how the body illuminates our humanness and humanity.